Join us on an authentic trip of Greece exploring the ancient sites of Athens and visit the island of Crete where we will connect with God’s heart for family and community through food. We will start in Athens where we will spend some time in this ancient city visiting the acropolis and Parthenon Temple. Other sites will include Mars Hill where the Apostle Paul famously spoke during his time in Athens and a visit to the ancient city of Corinth. We will spend 6 days based on the beautiful island of Crete where we will have time for reflection and a foodie adventure. Sophie Stokes, of ‘In Sofia’s Kitchen’ will join and lead us through our foodie adventure connecting with locals and experiencing the authenticity of Greek culture and family way of life. An additional extension to this trip is a 4-day cruise around the Greek Island visiting Ephesus, Patmos, Rhodes and Santorini. This trip has been created to bring a mixture of discovery, reflection and food adventure. Our time on the island of Crete is filled with cooking workshops, food walking tours, relaxing by crystal waters of the island and learning from the locals. You will get a chance to explore, taste and have a go yourself. If you love provincial country living, deliciously good food and immersing yourself in another culture this will be for you. We will also get an opportunity to connect with local Christians over dinner. Sophie’s heritage is Greek and growing up in Australiaenabled her to appreciate the diversity and expressions of both cultures as well as immersing herself in other European cuisine. ‘In Sofia’s Kitchen’ begins with the love of family and friends sitting around the dinner table. It is a place where everyone is welcome and included in discovering how to do life together. 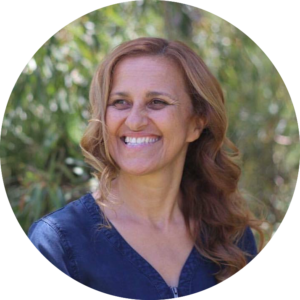 Sophie is creating opportunities for families and communities to make healthy food choices and authentic connection through cooking workshops, Mediterranean feasts, foodie retreats and Mediterranean Food Adventures. Sophie lives in NSW with her husband, children and grandchildren. She has a strong Christian faith and attends a local Church in Newcastle. Upon arrival into Athens you will be met by our local representative and transferred to your ​​accommodation. After checking in to the hotel, the rest of the afternoon is free to relax or ​​explore Athens. After Breakfast we will meet with our local guide for a tour of the City. We will enjoy a panoramic tour to see the highlights by the Tomb of the Unknown Soldier, Parliament House, Constitution Square, the Academy, the National Library, Panathenaic Stadium, Hadrianis Arch and the National Garden. We will then climb up to Acropolis Hill and visit Parthenon Temple and other buildings on top of the rock. We enjoy the beautiful views of the Roman Agora, the Odeon and the Theatre of Dionysus. We then walk to the nearby Mars Hill to see the spot where Paul delivered his well-known sermon about the ‘Unknown God’ followed by some free time in the Plaka area. We will then come together for Dinner at the Hotel. Depart Athens for our Foodie Tour in Crete. We will transfer to Athens Airport for a morning flight to Chania, Crete. Here we will be met and transferred to our hotel in the Kissamos area. You will have some free time for the afternoon to go for a swim or walk & then come together in the evening for a welcome dinner and greek dancing at the Erofili traditional restaurant in Neo Chorio. Following Breakfast we will make our way to Pnevmatikakis Winery for a brief introduction to ​​local wines including a wine tasting. Afterwards we head to Falasarna Beach for a ​​relaxing swim at this popular beach preparing us for a fabulous afternoon of ​​cooking. ​​Mid- afternoon we will head to Litsarda where we will participate in Valia and Yianni’s Cretan ​​workshop located on their hobby farm. You’ll learn how to cook popular Cretan ​​​​dishes such as stuffed tomatoes, kalitsounia and dakos. And eat together. We will also take a ​​walk around the garden and discover how to use herbs in our food. After Breakfast we will board a ferry and head towards the famous Gramvoussa & Balos beaches where you will enjoy crystal swimming or take a hike to the castle on Gramvoussa Island. Lunch and snacks can be purchased on board or locally. We will have a relaxing day exploring before returning for Dinner at a Greek tavern in the Kissamosarea called Maria's, well loved and respected by the locals. After Breakfast we head to a unique mountain retreat location for a cooking ​​workshop learning how to make homemade dough to wrap around our pita ​​pie, seasonal vegetable dishes and more. We will then sit back and enjoy our ​​creations. But before we do this, we will stop in at a quaint little village for a ​​taste of authentic baked goods in the local bakery. ​​During the afternoon we will make our way back to the hotel with a free ​​​​evening for Dinner (at your own expense). ​This morning we will make our way to Chania where we will enjoy a 2-hour Cultural & food ​​tour through the old city hearing about the extensive Greek history by our ​​local professional guide who has a vast archaeological, artistic and historical ​​knowledge of Crete. ​​You will have free time to do some shopping, grab some lunch and wonder the ​​​​streets of this cultural town. Tonight we will be meeting for dinner together with local Christians on the Island and a time of sharing and connecting. This morning we will head towards Loutraki beach which is located in the south eastern part of the peninsula towards Chania. A quiet beach with crystal clear waters. We will dine together at a local seaside resort, Mare Nastrum Villa Resort with a beautiful wide bay view followed by some free time. ​​Late afternoon we will go to Metochi Farm for a cooking workshop with Eleni and her family ​​who will prepare some much loved Cretan dishes such as stuffed zucchini leaves, ​​​boureki, lamb stew & cheese filled pastries. We will take a walk around their fruitful property and then join together for our last dinner on the Island enjoying our creations and Cretan hospitality. We will dine together at a local seaside resort, Mare Nastrum Villa Resort with a beautiful wide bay view followed by some free time. (lunch is at own expense). After breakfast we will be transferred to Chania International Airport departing for Athens. ​​We will then make our way for coastal highway of the Saronic Gulf and reach the historic ​​Corinth Canal for a brief stop for photos and refreshments. We will then visit the ancient site ​​of Corinth and the nearby small archaeological museum where we will share 15 ​​​minutes for devotions. We will enjoy lunch at a local Restaurant (own expense) and on our ​​way back to Athens we will visit a pottery and marble shop. We will arrive back late ​​​afternoon before having dinner together in the Hotel. 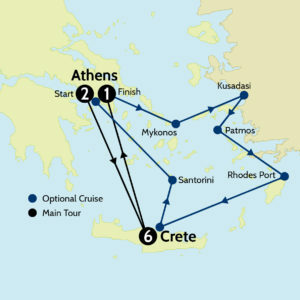 This morning, after breakfast we transfer to Piraeus port of Athens for embarkation on the ​​cruise ship. After customs formalities we will check-in to our cabins. ​​At 11.30am we set sail for the Greek Island of Mykonos enjoying lunch on board. At 6p.m. ​​we arrive at Mykonos. (Disembarkation either by tender-boats or the cruise-ship will dock at ​​the port of Tourlos). ​​Mykonos, the “Pearl of the Aegean Sea” combines international jet-set atmosphere. You can ​​stroll at leisure through the whitewashed, flower-decked alleyways, climbing to the ​​​sculpture church of Paraportiani and then along the waterfront of ​“Little ​​​​​Venice” to the well-known windmills. ​At 7:00 a.m. our cruise-ship will dock at the port of Kusadasi in Turkey. It is our starting point ​​for our ​excursion to the ancient city of Ephesus. Apostle Paul preached to the Ephesians ​​and lived here for three years. This church also received an epistle from him. We tour the ​​spectacular ruins of the city that was founded in the 10th century BC. We walk through ​​​history along marble streets lined with wonderful public buildings, among them the Baths of ​​Scholastica, the Library of Celsus, the Temple of Hadrian and the Theatre. We will see the ​​Temple of Diana, one of the seven wonders of the ancient world, before our return to ​​​Kusadasi. Enjoy some free time for souvenir shopping before embarkation. Breakfast on board. At 7:00 a.m. we dock at Rhodes port. ​​This stronghold was built by a Crusading Order, which originated from Palestine, and in ​​older days, it boasted of another achievements of the then known world - The Colossus of ​​Rhodes! Our morning half-day excursion takes us to visit the Temple of Athena on the ​​​majestic rocky Acropolis of Lindos, with the blue Aegean Sea beneath it and the ​​​sophisticated, ​whitewashed artists' colony at its foot. Local tradition has it that on his ​​​way to Rome; Paul’s vessels spent some time here in the small harbor (Acts 21:1) followed ​​by Lunch on board. Then we have the afternoon free in Rhodes for a most delightful ​​​experience. You can ​stroll around the medieval walled city; enjoy the cosmopolitan ​​​atmosphere from one of the elegant cafes in the marina. Sail for Heraklion, Crete at 6:00 ​​p.m. ​​Dinner & overnight on board. Breakfast and set sail fo a short stop to Heraklion on Crete before arriving the famous ​​​​volcanic island of Santorini with lunch on board. ​​​Upon arrival this afternoon we will anchor in the blue Aegean waters and disembark by ​​​tenders. Here ​we have an optional tour to Oia Village or we can stroll around the narrow ​​streets of Fira, the capital town, with white washed houses, coffee shops and boutiques, ​​overlooking the Aegean Sea. Free time to take pictures and become acquainted with the ​​characteristic buildings, carved into the rocks. ​​This evening, we sail for Piraeus port of Athens, with Dinner and overnight on board. At 6am the ship will dock at Piraeus port after breakfast we will disembark at around 8am. We are transferred to Athens Airport for our departure home or stay on for onward travel. What a trip! Space on this tour is strictly limited so please book in as soon as you can. Payment by credit card is accepted. Emirates Airways from Australia to Athens. We are holding group seats from Melbourne/Sydney. If you would like to depart from another Australian city serviced by Emirates, please contact us immediately so that we can request these seats. Aegean Airlines from Athens to Crete are also included in the full tour price. Flight schedules to be confirmed. Emirates economy class passengers can check in 30kg of baggage & are permitted one piece of carry-on baggage that may not exceed 22 x 15 x 8 inches (55 x 38 x 20cm) & must weigh no more than 7kg. However the Aegean flight from Athens to Crete has a strict baggage allowance of 23kgs. An excess will be charged for any baggage over these limits. Travellers with Qantas frequent flyer memberships are also welcome to nominate this for reduced points. We request the frequent flyer numbers for any travellers wanting to accrue points for this journey via the booking form or no later than the final payment deadline. You are very welcome to extend your stay or continue elsewhere after the tour. We do however strongly recommend that all additional arrangements only be made once the tour is GUARANTEED to depart (having met minimum numbers). If you are using our included airfare option there is a $150.00 to change your return flight. Outbound flights MUST be travelled with the group. Travel extension requests must be received in writing no later than Monday 6 May 2019. Selah is a full-service travel agency and can assist you with all additional arrangements. This makes your holiday experience much easier with all bookings held by the same agent. Most countries require your passport to be valid for 6 months after travel date. Prices are based on a twin shared room containing two single beds. A request to share is accepted at the time of booking. Clients electing to twin share with an unknown partner of the same gender do so in the full knowledge that Selah cannot guarantee the compatibility or medical fitness of your roommate. The single rate will apply at the time of booking. This surcharge will be refunded if Selah is able to provide a suitable partner. Travelling to ancient places means that many surfaces are cobblestoned and uneven. When on tour there is a reasonable amount of walking every day. Days can be long with early starts. You need to be of sound physical health and fitness to maximise your experience on the tour. If you have any concerns about your health and fitness, please speak to us. out www.traveldoctor.com.au about relevant vaccinations. A non-refundable deposit of $500 is payable to secure your place on the tour. The balance of payment is due 90 days prior to departure. An invoice will be forwarded to you prior to this date. Payments made by Credit cards incur fees (1.5% for Visa/Mastercard & 3.5% for American Express). Direct deposits into our bank account & cheques are welcome. The $500 deposit is non refundable. If the tour is cancelled by Selah (due to lack of number or security concerns) your deposit will be refunded. Cancellation 90-45 days prior to departure – 50% cancellation fee of total tour cost. It is vital that you are adequately insured for unforeseen cancellation. Please don't hesitate to contact our sales team for assistance and questions.